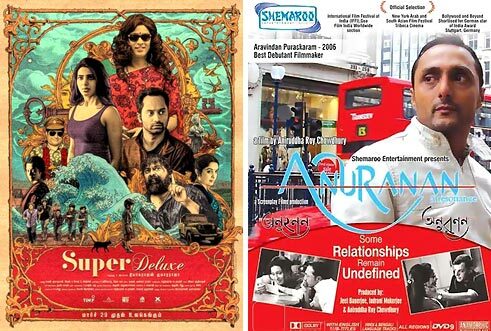 The write-up needs to be started with ‘a clear spoiler alert’ as this is all about a specific sub-plot included in Tamil film SUPER DELUXE (2019) directed by Thyagarajan Kumararaja and the main twist of Bengali film ANURANAN (2006 - meaning Resonance) directed by debutant Aniruddha Roy Chowdhury. Besides, this is also not an article making some kind of revelation or pointing towards any inspiration source to be honest, but is a comparative study analyzing how one intriguing story idea can be interpreted and presented in two completely contrasting ways by two directors in their own unrelated and different films. SUPER DELUXE begins with a married girl calling her college boyfriend after many years, inviting him over to her house as the husband is out for a few hours. As he arrives they quickly move into the bed and just after their act the man suddenly dies (of probably a heart attack) right on the bed in her home and she finds herself in a serious mess. Unexpectedly the director treats this absurdly funny situation as black comedy as the girl confesses everything truthfully to her husband in the very next scene and then they together try to get rid of the corpse lying on their bed by taking it out of their house. The sub-plot further gets converted into a twisted thriller as a corrupt cop enters the scene and they have a real tough time in the next few hours trying to get rid of both the cop and the corpse together. Interestingly a similar situation is there in the Bengali film ANURANAN too but in completely contrasting settings and circumstances. In ANURANAN we have two male colleagues in an office and their wives as two friendly married couples. Co-incidentally one of the colleagues meets wife of the other in a hill station where they both are on a tour individually and out of sheer courtesy stay in the same guest house. Unexpectedly that very night, the man dies a natural death and his sudden demise leads to police investigation humiliating the lady drawing the obvious conclusion of the couple having an extra-marital affair. No one believes the woman, not even her husband and this further results in a complete emotional trauma for everyone involved. So it’s the same basic idea used in both the films but in a completely contrasting manner as visualized and conceived by their respective writers and directors. 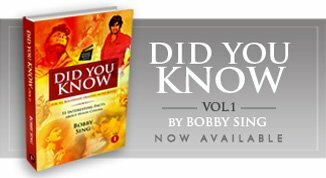 No doubt a writer/director is also a GOD of its own kind, who can write the same plot differently as per his or her own thought process and project requirement. An interesting case-study indeed, for all young students of cinema, looking into the possible variations of the same plot. Note: The Bengali film ANURANAN can be seen in both original and Hindi dubbed form at Youtube officially.